Isabella Harley never dreamt she would win a grand prix, but she headed home a quality 16-strong field to take the honours at the Taihape Area 61st Annual Showjumping Championships aboard her imported mare Brainy G.
It was just their third grand prix start, and Harley was quick to lay the credit with her 12-year-old horse. Brainy G, a Dutch warmblood who is by Corland out of Nananda (by Indoctro), was imported as a four-year-old and produced for the next four years by Oliver Edgecombe before heading to Harley. Harley said the horse seemed to go very well on a rather wet track. The combination was also second in the Dunstan Horse Feeds and EquiFibre Pro Am Series earlier in the show. In the Country TV Pony Grand Prix just two of the 17 starters came through to the jump-off. There Olivia Apatu (Waipukurau) and Alasaan Arzu were all clear in 33.87 seconds, with Sarah West (Matamata) and Miss Mae West settling for second with their double clear in 37.01 seconds. Courses at the show were designed by Heather McDonald. Dunstan Horsefeeds and EquiFibre Horse Grand Prix: Isabella Harley (Wellington) Brainy G 1, Nicholas O’Leary (Wanganui) Obeone Kanobe 2, Tim Myers (Hawera) Surreal 3, Geordie Bull (Taupo) Forest Hill 4, Stephen Nickalls (Palmerston North) Letino 5, Robert Steele (Dannevirke) LT Holst Bernadette 6. Country TV Pony Grand Prix: Olivia Apatu (Waipukurau) Alasaan Arzu 1, Sarah West (Matamata) Miss Mae West 2, Luke Myers (Marton) Te Urewera Magic 3, Danielle Taylor (Wellington) Cee Cee 4, Kaitlyn Freeman (Otaki) Rum Tum Tui 5, Lily Moore (Hastings) Showtym Highlight 6. FMG Young Rider Series: Blake Davis (Palmerston North) Socrates de la Vie Z 1, Ike Baker (Pauatahanui) Hawkesdale Mahe 2, Hannah Bodle (Morrinsville) Whakanui de l’Amore 3, Blake Davis (Palmerston North) Maddox Alheart 4, Ike Baker (Pauatahanui) Centrico 5, Matt Irvine (Takapau) Wall Street III 6. Dunstan Horse Feeds and EquiFibre Pro Am Series: Emily Fraser (Palmerston North) Kiwi Sunray 1, Isabella Harley (Wellington) Brainy G 2, Todd Gloyn (Palmerston North) Ten Talents 3, Todd Gloyn (Palmerston North) Air Hill Bambi 4, Heloise Tolo (Ohariu Valley) Lansbury Grosve GNZ 5, Bryce Newman (Bulls) Bates Game Keeper 6. 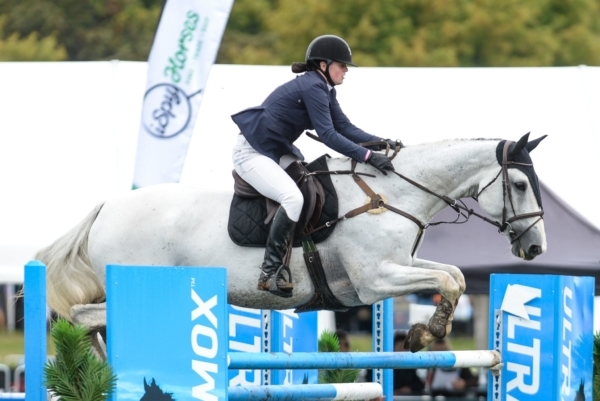 Dunstan Horsefeeds and EquiFibre Junior Rider Series: Brigitte Smith (Mangaweka) Corlinka 1, Samantha Carrington (Takapau) Double J Breeze On 2, Sally Kincheff (Rotorua) Believe NZPH 3, Amy Gibbs (Marlborough) Soho 4, Sarah West (Matamata) Erl Grey II 5, Mackenzie Barclay (Taupo) Cassiento 6. Caledonian Holdings Amateur Rider Series: Tarnia Morris (Taupo) Blackhawk 1, Marcus Rose (Dannevirke) Kaipara Hold UP 2, Emma Deadman (Taupo) Avichii AF 3, Zoe Gordon (Hawke’s Bay) Scandal 4, Vanessa Kelly (Oakura) NZ Supreme 5, JO Bell (Taupo) Rewae 6. East Coast Performance Horses Five-Year-Old Series: Anna Trent (Otaki) Clearcut Xtreme and Matt Irvine (Takapau) Bluetooth =1. Mitavite Six-Year-Old Series: Simon Wilson (Waipukurau) McMillans Whimsical WDS, Amanda Pottinger (Havelock North) Good Timing and Robert Steele (Dannevirke) Two Eye See =1. Main Events University Series: Hannah Bodle (Morrinsville) Whakanui Home Brew 1, Emily Fraser (Palmerston North) Kiwi Sunray 2.